A dictionary definition of atlassing (a new noun!) would read “the systematic survey of the fauna or flora of a geographical region”. Mapping birds has become a world-wide phenomenon. It is fun to participate and the results provide an invaluable foundation for conserving birds and their ecosystems. To date, atlases have almost always been produced as large books, but very recently that has begun to change, with a switch to online interactive versions. Nature atlases provide a snapshot of where animals or plants are distributed, and how many of them there are. They are designed to be repeated at intervals in the future, so that changes can be accurately tracked over long time periods. In Canada, bird atlases are conducted at a provincial scale; it takes five years to gain a meaningful snapshot. Grids of squares are systematically surveyed using standard techniques. To learn more about Canadian bird atlases click here. Birds are probably the longest studied and best known animal group among amateur naturalists. They are also particularly effective biological and environmental indicators because they are conspicuous, occur in every habitat and respond quickly to habitat change. There are lots of birders with the skills and dedication to accurately conduct surveys as volunteers, in an extremely cost-effective way. Volunteerism is at the heart of atlassing. In provinces the size of British Columbia, this involves a major effort, coordinated from a central project office through a supporting a network of about 40 volunteer regional coordinators who oversee atlassing in their catchments. Many birders like to take part in projects that give purpose to their passion, and, for that reason, atlassing is a favourite of birders around the world. Atlas projects prompt birders to cover their neighbourhoods in more detail than they have before, draw them into other nearby areas they have seldom visited, and give them opportunities to explore wilderness regions where every new sighting fills in a potentially important information gap. Since the first one was completed in Great Britain in the 1960s, bird atlases have become one of the most valuable tools for tracking environmental change—a tool that has allowed biologists and land managers to make wiser conservation decisions. Early written descriptions of bird distributions in British Columbia began nearly a century ago with a review by Brooks and Swarth (1925) of the bird fauna. James A Munro and Ian McTaggart Cowan updated the review in 1947. Our understanding took a great leap forward with the publication of The Birds of British Columbia by R. Wayne Campbell and his co-authors, a comprehensive review of the distribution and biology of all birds prior to about 2000. 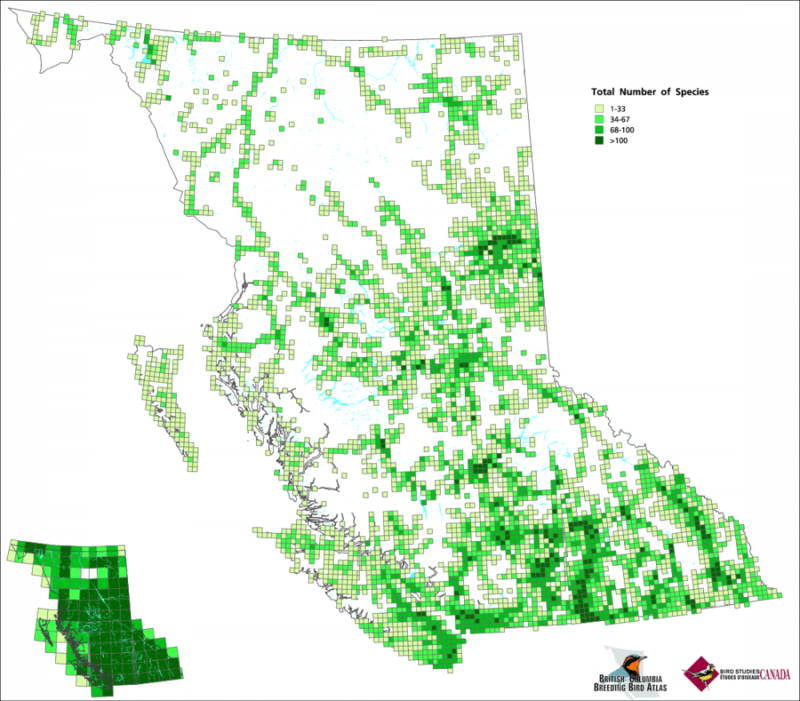 The British Columbia Breeding Bird Atlas builds on those efforts, and is one of a series of provincial-scale projects that form Canada’s National Atlas Program. The National Atlas Program is a partnership between Environment Canada, Bird Studies Canada, provincial governments, natural history organisations and the private sector. It began in 2000, with the second Ontario Breeding Bird Atlas, which developed a successful business model combining the complementary strengths governments, non-profits, grass-roots and corporate businesses. That model has since been effectively replicated in six Canadian provinces. Each provincial-scale breeding bird atlas is a minimum eight-year undertaking―a start-up year, five years of field surveys, and two years of publication. The average price tag is $250,000 per year. That financial cost is matched by skilled volunteer citizen scientists―members of the provincial nature societies and the birdwatching public―who typically contribute >10,000 hours per year conducting field surveys. Breeding Bird Atlases under the Bird Studies Canada-Environment Canada national program have been completed or are underway in Ontario, the Maritime provinces, British Columbia, Manitoba and Quebec. More are in the planning phase for other provinces. National atlas program results drive conservation policy, species at risk recovery, habitat management and stewardship, and land acquisition. To learn more, and to participate, click here. Canada’s National Atlas Program is strongly represented on the North American Ornithological Atlas Committee (NORAC), a group which facilitates and encourages the use of bird atlases for research, monitoring and conservation of birds in the Americas. Brooks, A. and Swarth, H.S. 1925. A distributional list of the birds of British Columbia. Cooper Ornithological Club, Berkeley, Calif. Pacific Coast Avifauna number 17, contribution number 423 from the Museum of Vertebrate Zoology of the University of California. Munro, J.A., and I. McTaggart-Cowan. 1947. A review of the bird fauna of British Columbia. British Columbia Provincial Museum Special Publication No. 2., Victoria, B.C.